Join us on Tuesday October 2, 2018 for our annual Teacher Appreciation Night and Open House. October 2, 2018: 5-7 p.m.
Be our guests as you are introduced to the world beneath the sea and the resources available to you through Birch Aquarium at Scripps. At 5 p.m. we open the Aquarium to you! Come enjoy light refreshments and at 6 p.m. an introduction to opportunities for you and your students, including Financial Aid available to bring the Aquarium Express Outreach Van to your classroom and how we are aligning our programming with the Next Generation Science Standards. Visit our classrooms and enjoy tabletop presentations of Birch Aquarium's school programs. Learn how to easily book your school programs either online or over the phone. Tour all of our exhibits and get helpful tips from our education specialists on how to plan the most effective and exciting field trip to Birch Aquarium. 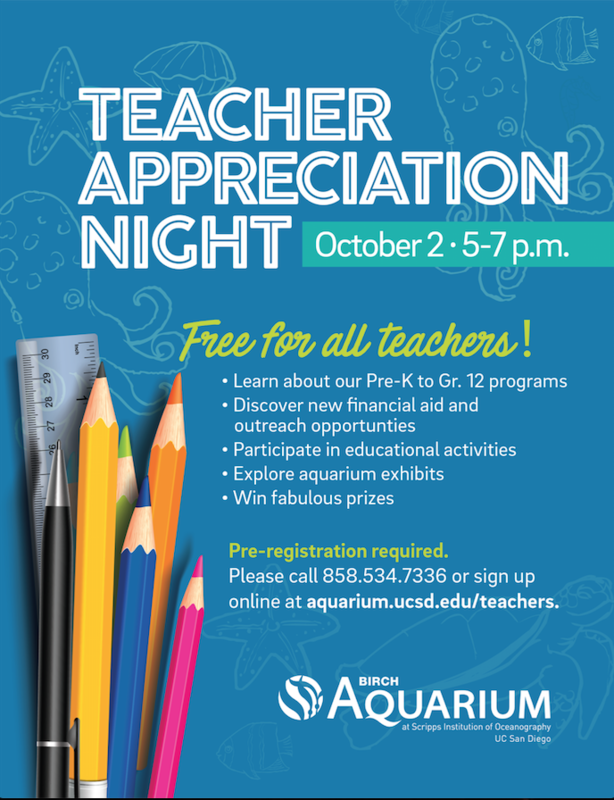 Don't miss your chance to win fabulous raffle prizes, including a free Aquarium Express Outreach for your class! Get 20% off on all Gift Shop purchases until 7 p.m.! Please note that this event is available to educators and administrators only.